Hourglass is the “New Look” of the season. Versace makes the most of it in conformity to the high end peplum trend. The hips are important, as vigorously stressed at Milan Fashion Week. There’s no alternative to peplum numbers when it comes to the current vogue. Donatella Versace made such statement clear enough by revisiting the concept of shimmering steel which defines a peplum and gives focus on the hips. The same shimmering steel is used to emphasize that bust area, making the collection more attractive, fashionably seductive and forwardly feminine with lots of chic. 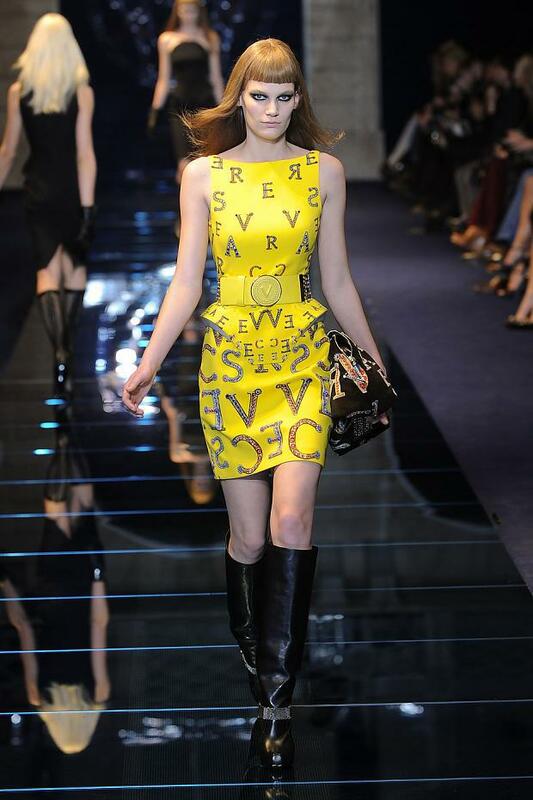 Chez Donatella Versace the mood was Rooney Mara goth chick–meets–Flash Gordon galactic goddess. Guido’s Rooney–bangs wigs gave all the Versace girls that dramatic look, and a cross motif also played to the Gothic theme—there were crosses silk-embroidered on a short black velvet coatdress; spangled in dark jewels on the bustier of a shapely cocktail frock; worked into edgy-looking black “lace” shadowed over a white sheath; embossed into a leather skirt to resemble panels of antique Cordova leather; and photo-printed on body-gripping leggings. There was, however, something more profane than sacred in those thigh-high boots—in a very saucy fishnet mesh. Taking a page from her haute couture collection, Donatella revisited the idea of those arcs of gleaming steel to define a peplum or give greater emphasis to a bustline—like the lady of the House, the Versace silhouette is all about the hourglass. Acid yellow and screaming orange punctuated the predominantly black-and-white palette, and the shaggy silken strands of alpaca added texture interest to a boxy jacket, whilst graphic little coats were spliced with panels of Oroton—Gianni Versace’s signature chain mail, lending them the air of a sword-bearer in a forties Hollywood epic. 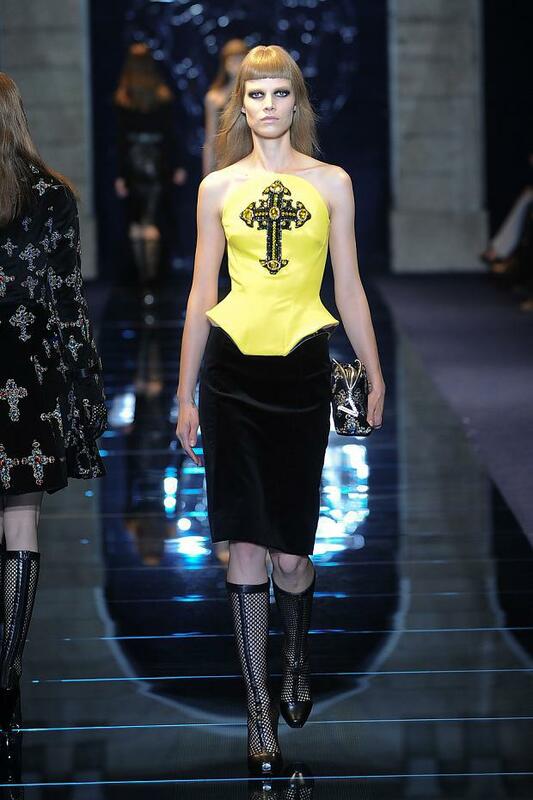 VERSACE—picked out in jewels like the letters in a medieval illuminated manuscript—tumbled over satin sheaths, and the same motif lit up the runway when the lights were lowered for the finale numbers. Using a technique evocative of Paco Rabanne’s sixties chain-linked discs and panels, Donatella used strips of rhodoid plastic, flashing crystal, and that signature chain mail to create this series of high glam mini-dresses and hobbling sheaths that seemed fashioned for a New Age Princess Leia.